Massive Storm Damage In Florida's Panhandle [VIDEO] - Joe.My.God. The Category 4 hurricane was the fiercest to hit Florida in 80 years when it came ashore on Wednesday, but its strength waned as it pushed into Georgia. Early on Thursday, it was downgraded to a tropical storm, with top sustained winds diminishing to 60 miles per hour. More than 700,000 homes and businesses were without power in Florida, Alabama and Georgia early Thursday. Thousands hunkered down in shelters overnight after fleeing their homes to escape the fast-approaching storm. 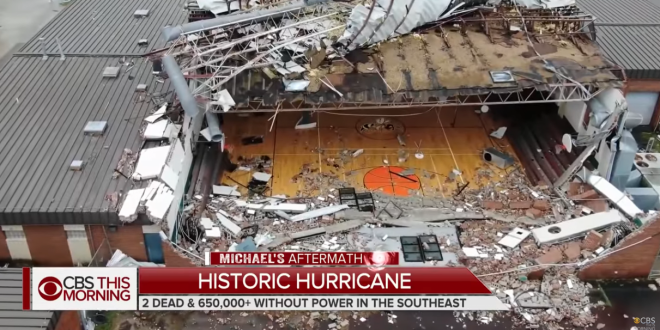 The storm, packing sustained winds that reached 155 miles per hour, clobbered communities across the Panhandle, toppling buildings, downing trees and power lines and turning streets into roof-high waterways, television footage showed. After making landfall near Mexico Beach around 2 p.m. ET, the eye of Michael moved inland over the Florida Panhandle east of Panama City. Wind gusts blew out windows in homes and office buildings, including the First Federal Bank.